What It Is: An indispensable hand and nail treatment cream formulated to preserve the smooth, supple appearance of hands. What It Does: Professional, emollient-rich treatment-with soothing Sesame Oil and fortifying Japanese Mulberry-forms an invisible protective glove that shields hands from the elements, minimizing signs of aging. Softens and comforts dry, chapped, irritated skin. Helps strengthen nails and condition cuticles for youthful-looking hands, naturally. 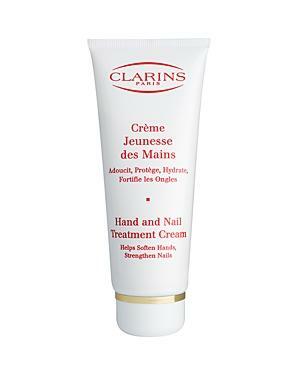 Clarins Hand And Nail Treatment Cream/3.3 Fl. Oz.